The leases standard, which was jointly developed by the Financial Accounting Standards Board and the International Accounting Standards Board but has some differences under U.S. GAAP and International Financial Reporting Standards, will put operating leases on the balance sheet of many companies for the first time. 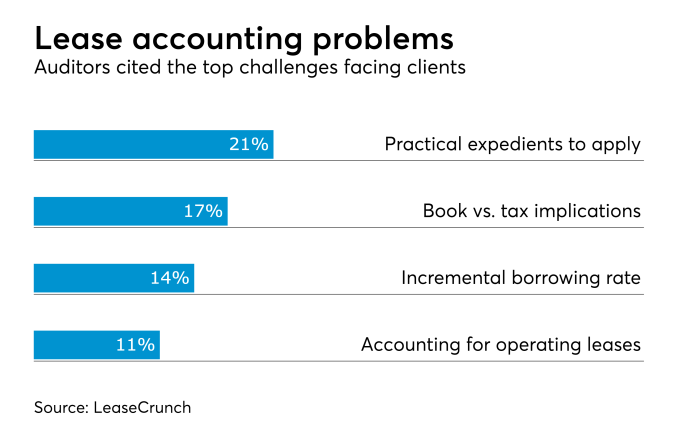 A new survey from the lease accounting software company LeaseCrunch® polled auditors from 77 different CPA firms in the U.S. about the upcoming changes. Of those auditors who have started conversations with clients about the new lease accounting requirements, the number one problem is determining which practical expedients should be applied (21 percent), followed by book vs. tax implications (17 percent), determining the incremental borrowing rate (14 percent) and accounting for operating leases (11 percent).